Beekeeping is becoming more common and potential beekeepers have many options to choose from for hives. As beekeeping can be a rewarding pursuit, people are paying closer attention to the available bee hives for sale. Bees are territorial and the hive will be their home, an ideal environment to protect them from invasive behavior, so choosing the right bee hive is important. There are several factors to take into consideration when making the best choice among the commercially available bee hives for sale. This requires at least a basic understanding of bees and the purpose that the hive serves. From the perspective of the bees, the hive has to disturb these creatures as little as possible while also encouraging them to produce honey, which you will collect. Naturally, as the beekeeper, you have certain requirements from a hive. The bee hive should have an easy setup and should be capable of being transported. It should be easy for the bees to access and provide the right ventilation. The bee hive should maximize honey production and fit within your budget. Remembering these will help you make the best choice among the possible bee hives for sale options. The right bee hive not only provides you with the features you need in a hive kit, but it also helps you to avoid the problems that some beekeepers run into with their setups. 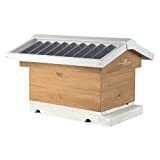 The Apimaye 10 Frame Langstroth Insulated Beehive Set has received high ratings from online reviews of bee hives for sale because of its many unique features. As you get to know this product, you will see how it stands out from the rest. Apimaye 10 Frame Langstroth Insulated Beehive Set is a little different from some other bee hives for sale you might have come across. It is made of double-insulated UV-resistant plastic instead of wood, which allows the bee hive to remain warm even during the coldest months of winter. The setup provides great ventilation and allows for the use of wooden or plastic screens. A couple of unique features protect the owner of the Apimaye 10 Frame Langstroth Insulated Beehive Set from the pitfalls that paralyze other beekeepers. The hive features a screened bottom board that features a drawer that helps to trap fallen pollen while also protecting from ​varroa mites. A top cover feeder prevents drowning while an entrance reducer diminishes the risk of looting. Like many manufactured bee hives for sale, the Apimaye 10 Frame Langstroth Insulated Beehive Set consists of a box hive set up with drawers and interior frames. It is delivered already assembled, allowing it to be utilized right away by the advanced beekeeper and the beginner without a headache. Because it is made of double-insulated plastic, it is temperature-regulated during cold temperatures. The plastic features of the hive kit also protect the Apimaye 10 Frame Langstroth Insulated Beehive Set from rotting and warping. The setup protects from small hive beetles and mites. It comes with top feeder, entrance reducer, frame spacers and screened bottom board. The Apimaye 10 Frame Langstroth Insulated Beehive Set weighs about 60 pounds and measures about 25 by 25 by 20 inches. Pricing is a factor to take into consideration when deciding which bee hive for sale is the best for you while weighing this with other important factors like design and transport. 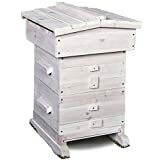 Because the Apimaye 10 Frame Langstroth Insulated Beehive Set features a unique design and comes with a host of features, it is on the pricier side when it comes to other, wooden hive kits. The Apimaye 10 Frame Langstroth Insulated Beehive Set sells for around Out of stock. This is more expensive than some other products we will review here, but one should take into consideration that the best bee hives for sale will last a lifetime. This product can be purchased from Amazon, on the manufacturer website or on the websites of sellers of other high-quality hive kits. Another hive kit option to consider is Goodland Bee Supply’s Complete GL4STACK 4 Tier Bee Hive Kit. This product is constructed entirely out of pine and follows a simple drawer design comprising two large brood body boxes and two super boxes. Like many bee hives for sale, this product arrives unassembled. It is designed for the beginner and is a quality investment for a beekeeper just starting out in the field. Some features of the Goodland Bee Supply Complete GL4STACK 4 Tier Bee Hive Kit that stack up well with the Apimaye 10 Frame Langstroth Insulated Beehive are the 20 pine frames and 30 plastic Pierco foundations that come with the set. This product also features a bottom board and entrance reducer. At about , it is affordable. The easy assembly does not necessarily require nails to complete. With its well-thought-out features and easy assembly, the Ware Manufacturing Home Harvest Beehive is a solid choice for the beginner and the advanced beekeeper alike. Its white cedar construction provides natural resistance to mites and other insects while its pitched roof allows rainwater to fall away from the interior of the hive. This peaked roof is attractive and will look right at home in a backyard. Other unique features of the Ware Manufacturing Home Harvest Beehive compared to other bee hives for sale are its twin observation windows and ventilation-friendly design. At about $213.99, the unit is very affordable. It is expandable, allowing the beekeeper to add more boxes to accommodate more bees. The design of the Ware Manufacturing Home Harvest Beehive provides natural insulation during warm and cold temperatures. The modern beekeeper has many options to choose from when it comes to finding a bee hive for sale that both meets his or her needs as a beekeeper while also providing a functional, livable home for the bees. The SummerHawk Ranch 34991 Backyard Beehive is a hive box with several interesting features, which set it apart from other products of a similar design. The ​SummerHawk Ranch 34991 Backyard Beehive features a quick-check viewing window, allowing the beekeeper to monitor the bees. It has a screened bottom board with notches that allow the hive box to be attached to the Victorian Teak hive stand. Though the stand is sold separately, this unit comes with eight wooden frames and plastic foundations, so the beekeeper does not have to worry about these. The specially designed roof directs rainwater and debris away from the roof while also deflecting sunlight. The SummerHawk Ranch 34991 Backyard Beehive feature like other, similar bee hives for sale can be expanded to accommodate a growing bee colony. This product requires assembly. This product is a good starter hive box for a beginner and the more established beekeeper. The SummerHawk Ranch 34991 Backyard Beehive weighs about 16 pounds and including the other components, the shipping weight is about 30 pounds. It measures approximately 22 by 22 by 21 inches, and it sells for about . Beekeeping is more than just a hobby, and the modern beekeeper has to sort through a few options when it comes to bee hives for sale. Though all products on the market are of wood or plastic construction, the goal of the beekeeper should be to invest in a hive that provides a comfortable home for the creatures. Striking this balance allows the bees to meet their needs while allowing you to collect their honey. Choosing the right hive is difficult, and the process is muddied by many of the available options. Fortunately, there are many variables to take into consideration like price, ease of assembly, quality of design, ease of use, construction materials and the capability for expansion. Though there may be overlap between products of similar quality, sometimes one product stands out from the rest. The Apimaye 10 Frame Langstroth Insulated Beehive Set is just such a standout. Most features that would deem one bee hive for sale superior to another were taken into consideration with the design of this product. The double-insulated plastic construction allows for temperature regulation while also protecting the product from insects. This product comes assembled, so the beekeeper does not have to worry about making sense of the complex parts involved in the design. It can be easily transported. The product features an entrance reducer to diminish the risk of looting and a top cover feeder to reduce the risk of drowning. The plastic design prevents cuts moisture to avoid fungal growth while also preventing rotting and warping. 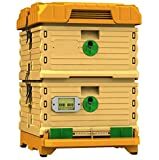 The Apimaye 10 Frame Langstroth Insulated Beehive Set is a superior product that wins out over similar bee hives for sale in most measures, especially quality, assembly and ease of use. It is more-expensive than some other options, but it represents an important investment that will accommodate a large and thriving bee colony. All in all, this product receives a 5-star rating. The Apimaye 10 Frame Langstroth Insulated Beehive Set stands out among its competitors in the market today. The product is already assembled when delivered, allowing it to be used right away. The best part is that it comes in a double-insulated UV-resistant plastic instead of wood, which allows the bee hive to remain warm even during the coldest months of winter. It's a quality investment you wouldn't want to miss. Burt’s Bees Lip Balm Review: Is This Organic Lip Balm For You?